The bitter and protracted struggle between President Thomas Jefferson and Supreme Court Chief Justice John Marshall defined the basic constitutional relationship between the executive and judicial branches of government. More than 150 years later, their clashes still reverberate in constitutional debates and political battles. 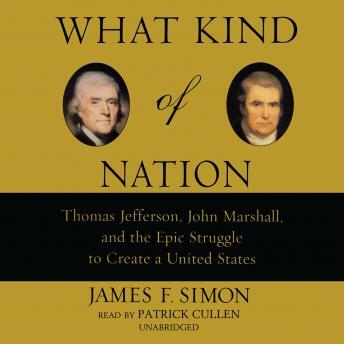 In this dramatic and fully accessible account of these titans of the early republic and their fiercely held ideas, James F. Simon brings to life the early history of the nation and sheds new light on the highly charged battle to balance the powers of the federal government and the rights of the states. A fascinating look at two of the nation's greatest statesmen and shrewdest politicians, What Kind of Nation presents a cogent, unbiased assessment of their lasting impact on American government. National Review's 100 Best Nonfiction Books of the Century.